Last year was a busy one for us, but here’s a feel for some of the things that we were able to do at Salem Social Village during 2016 – some you’ll have read about previously, others you might not have. It does demonstrate that we’ve been busy! Our staff and volunteers prepared and ran an event, complete with entertainment and gifts, at the regional children’s hospital to support kids with advanced-stage cancer – assisted by various local organisations and businesses. Our volunteers took part in an event to encourage people to work towards a cleaner city. Our staff donated blood twice at the regional blood centre. We took part in the international charitable campaign ‘Giving Tuesday’ with a local fundraising initiative that raised funds for the local organisation ‘Kinzhida’ which works with homeless women in Shymkent. We distributed small assistance grants to a large number of individuals and families in various difficult circumstances of significant need. We distributed material support to the nearby Orphanage for Children with Disabilities. We helped a number of large families in difficult circumstances to be able to get the various school supplies and equipment that they needed. We gave gifts to various mothers in challenging circumstances to celebrate International Women’s Day on 8th March, and gave gifts to people with disabilities to celebrate New Year. We supported various large families in difficult circumstances with simple groceries and diapers for kids. We were able to distribute wheelchairs received through our Humanitarian Aid project to six different people. Our Humanitarian Aid project also distributed aid to different educational organisations. We distributed 20 boxes of crockery and other kitchenware, received by our Humanitarian Aid project, to a charitable soup kitchen opened in a significantly under-privileged part of the city. The Social Club ‘World Without Limits’ independently organised and ran a New Year party in our cafe. The members of the ‘World Without Limits’ Social Club became more adapted and integrated into society thanks to their regular visits to Salem Social Cafe. They have become more independent and discovered a greater personal life. The relationships between them all has also improved. The Salem Social Cafe hosted a free event to celebrate the national festival Nauriz, or Kazakh New Year. We prepared and hosted a big celebration to mark 20 years of the work on Salem and its predecessor organisations in Shymkent. 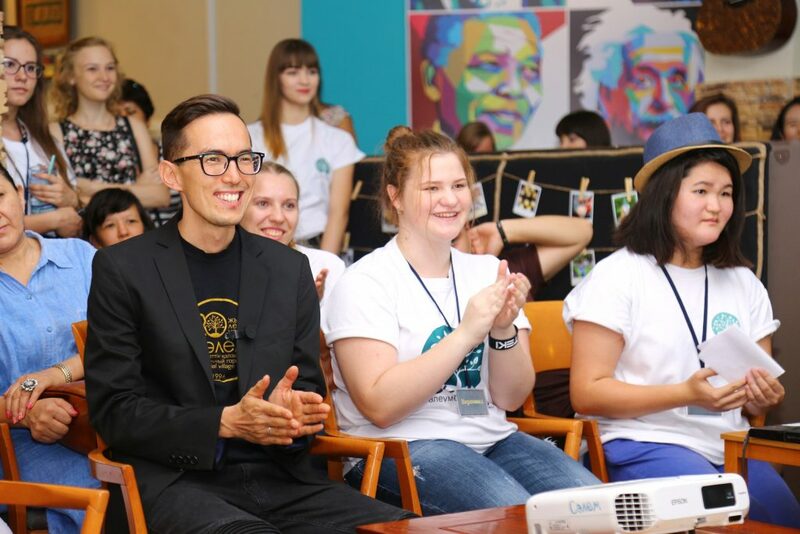 Salem’s Executive Director gave a presentation on the theme of Social Entrepreneurship to the youth conference ‘Zhas Camp’ in the cities of Semey and Pavlodar. Our Executive Director also gave the ‘Social Entrepreneurship’ presentation to other audiences at Salem, including our staff and volunteers. In addition, he visited the Kazakhstan Parliament in Astana as part of an initiative to engage the country’s young leaders in the political process, where he was able to ask about inviting foreign citizens to Kazakhstan in order to give professional training in English. Salem Social Cafe also organised a number of creative evenings which included live music from some local groups. Our Training Centre team ran the interactive simulation game ‘Struggle for Survival’ for hard of hearing young people and students from Miras University. The Training Centre team also prepared and ran a corporate team-building event for 90 staff from the local Kazkommertz Bank. The AIDS Xperience installation welcomed many groups, including some young activists from the South Kazakhstan State University, students from Nazarbayev Intellectual Schools, students from the local military academy, and students from Salem’s English courses. Throughout 2016, a total of 560 people went through the AIDS Xperience. The Training Centre team developed partnerships with a local school and a university for assisting their social education programmes. The Training Centre team gave training in social issues to the Kazakhstan Engineering and Education University (previously the Academy of Languages) which included more than 100 people. In total throughout 2016, more than 350 people took part in Training Centre events, whether the various simulation games or training activities (not including the AIDS Xperience). The English Centre project moved from a four semester schedule to five semesters, enabling more courses to be offered. The English Centre managers and teachers held the first parents’ meeting for children studying on Salem’s English courses. Conversation Club continued to run throughout 2016 in the Salem Social Cafe, led by native English speakers with the goal of providing a platform for practicing conversational English and raising the level of proficiency of the English learners of Shymkent. During 2016 we developed and implemented a 40 hour leadership course in English. The English Centre welcomed an experienced trainer of English teachers from the US to Salem, a specialist in the area of linguistics for non-English speakers, who gave courses over two months to Salem’s teachers and to others from schools in Shymkent. The English Centre team’s professional teachers continued to deliver English courses, all the time developing in their own skills and experience with students of all ages, levels and backgrounds. In total during 2016, a total of 1260 people studied English on our English courses. A master class was given at the English Centre in English sign language. An Olympiad was launched by the English Centre to test the knowledge of students from Beginner to Upper-Intermediate level. The English Centre teachers prepared and ran the annual children’s summer camp for learning English through fun and games. The Salem Social Village team successfully completed a study of one of the most well-known management books on the theme of personal and professional growth by the author Stephen Covey, a specialist in the areas of management and organisational leadership. Our maintenance team organised and ran a fire-safety training session for all Salem Social Village staff. Salem staff took part in two seminars in Almaty on the theme of development and leadership by John Maxwell, after which they prepared and gave a presentation of this leadership material to the rest of the Salem team. Three team-building sessions were run for the Salem Social Village team during 2016, with the goal of developing team relationships and strengthening team spirit. In the middle of 2016, the Salem team began to study the next book by Stephen Covey in the areas of management and organisational leadership, ‘The Eighth Habit’. In March 2016, the Salem Social Village team had a two day training retreat with visiting friends from the UK. Our security guards who are responsible for the safety and security of our site were further equipped for their duties during 2016 with a uniform! The Salem Social Village team’s morning planning meetings were altered to increase the training component. This has noticeably enhanced personal effectiveness and professional development, having a significant impact on the work and personal lives of many on the team. Teachers from the English Centre took part in three methodology seminars organised by the British Embassy in Kazakhstan. The Teachers also started a refresher course for their personal qualifications, in preparation for the international testing system IELTS. As well as all that, the teachers also took a refresher course with the Friendship of the Nations Russian University, gaining 5 year certificates of their competence. And finally, for the teachers at least, they twice during the year took part in an inter-city Olympiad for English, taking prizes for first and second place! The leaking roof of the Salem Social Cafe was completely replaced with a nice new one. The space previously occupied by a tenant running a medical clinic was completely renovated into an office for staff, a lunch and meeting room for staff, and a conference room. A surveillance system was installed in all public areas within our buildings to enhance the safety and security of all staff and visitors. Two rooms previously used for other purposes were renovated and brought into use as classrooms for English courses, taking the total number of classrooms at Salem to nine. The old water supply pipes and meter were replaced on our site with a new connection to the wider water supply network and a new water meter. The gas supply was also altered through a new connection onto the upgraded city gas supply network. During 2016, our programme of maintenance upgrades and management of our site and buildings also included two air conditioners, two computer monitors, a printer and a set of building tools. We also installed a chin-up bar on the site to encourage our staff to take regular physical exercise! After a long-running campaign, we successfully raised the funds required to replace the roof of Salem Social Cafe. The international charitable organisation Crossroads Foundation sent Salem Social Village two 40 foot containers of humanitarian aid during 2016. These quality donated goods included 75 new wheelchairs supplied by Medline Industries, clothes, shoes, furniture, fabric rolls, bedroom and kitchen items, and also many other items! Salem Social Village was again an active participant in the international charitable campaign ‘Giving Tuesday’, organising a special event in the cafe to raise funds to help homeless people in Shymkent. We also received many generous donations of financial support from various individuals in Kazakhstan and other countries. During 2016, the Salem leadership team organised two mini-retreats, strategic discussions regarding the development and improvement of Salem Social Village. In August, a new team was appointed to oversee the work of Salem Social Cafe, with some big improvements resulting. The new cafe management team brought in many new ideas, including very well-received student snacks for our younger English course attendees. They also introduced a new management system in the cafe for purchasing and stock management. Various existing Salem staff began working with the Training Centre team, enhancing integration and skill development. Also during 2016, a new management team was created for the growing English Centre project.